You know the feeling of having discovered something so incredible and special that you wonder how on earth others haven’t found out about it yet? And then finally they do find out about it, and it “sells out” and no longer has that charm that captivated you in the first place? That’s what’s happened with my favorite coffee shop in Brooklyn: Cafe Grumpy. Ever since I moved to NYC 5.5 years ago, that place has been my jam. Now that it’s been featured on the hit show ‘Girls’ (which I absolutely LOVE and cannot hate on here), it’s blown up. Good luck finding a seat on weekends. Also, the price for a plain ol’ cup of brewed coffee has gone up by $1 in the past year. My favorite cafe is just not the same anymore, and I’m not ready to accept that. I think the same thing has happened with Jungle Beach in Vietnam. I pictured it as this idyllic private beach that only a select few in the world would ever come to know. A place where you could laze around in your hammock all day, frolic on the beach, and then sit down to a communal dinner with your new friends from the resort. And for all intents and purposes, that’s pretty much what it was. But something was missing. It just didn’t feel special. 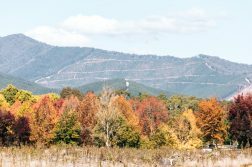 I visited in the shoulder season, so there were only a handful of other people there when I arrived. But then the next morning, a massive tour group descended on Jungle Beach and took over the whole resort. I couldn’t go anywhere without seeing or hearing those 20-somethings. For the most part, they were respectful and cool – but it killed the ambience for me. If I had wanted a tour group experience, I would have signed up for one. One good thing came out of it, though. At least half of the group were Canadians – and as a result, I can now officially discern the Canadian accent from the American accent. The secret? Listen to the way they say ‘about’ – it’ll sound more like ABOAT. And the funny thing is, when I pointed this out to a few Canadians I met while in Asia, they were all indignant and insisted they didn’t say it like that. Except they DID – every single one of them! Paying for coffee – I don’t know why on earth they don’t include coffee with breakfast every morning. If you want it, you’ll pay 30,000 VND ($1.40 US). 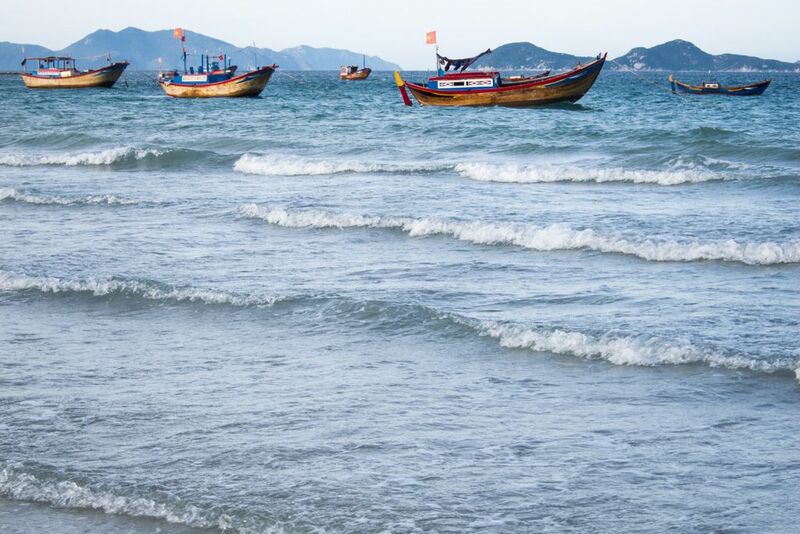 It’s kind of expensive – $30/night is a far cry from what you’ll typically spend elsewhere in Vietnam on budget accommodation, but when you factor in the all-inclusive aspect it’s not as unreasonable. It’s a hassle to get to – In a way, I like this because in theory it should discourage people from coming here. But it does require a significant investment of time and money to get to Jungle Beach. 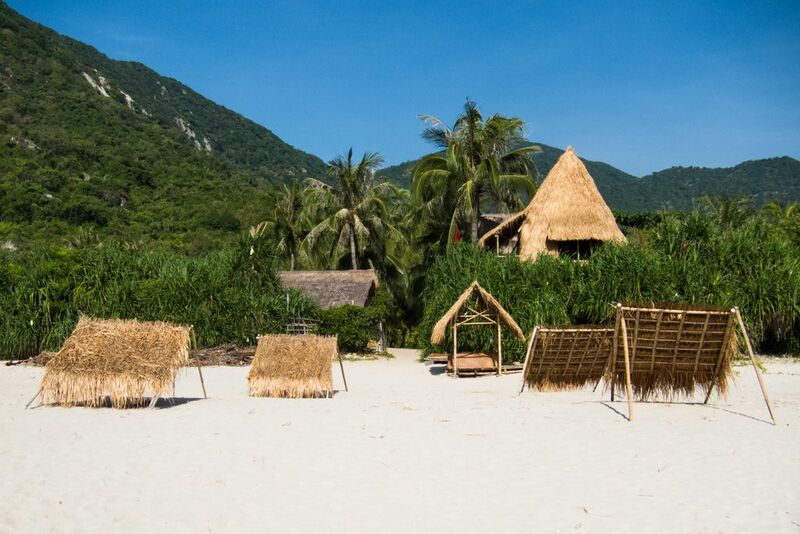 Too many people know about it now – Jungle Beach is no longer Vietnam’s best-kept secret. Sadface. The food – For breakfast, you can choose between a few different options on the menu and order whenever you wake up (Tip: go with the fruit pancake or french toast – AMAZING!). Lunch and dinner are served at set times, communal-style. There were always several dishes to try, and they were usually quite delicious. Sometimes it felt like there wasn’t enough food, other times it felt like there was too much! Free lemon water – It was nice not to have to buy my own bottled water every day. At Jungle Beach, you can help yourself to as much lemon water as you want! 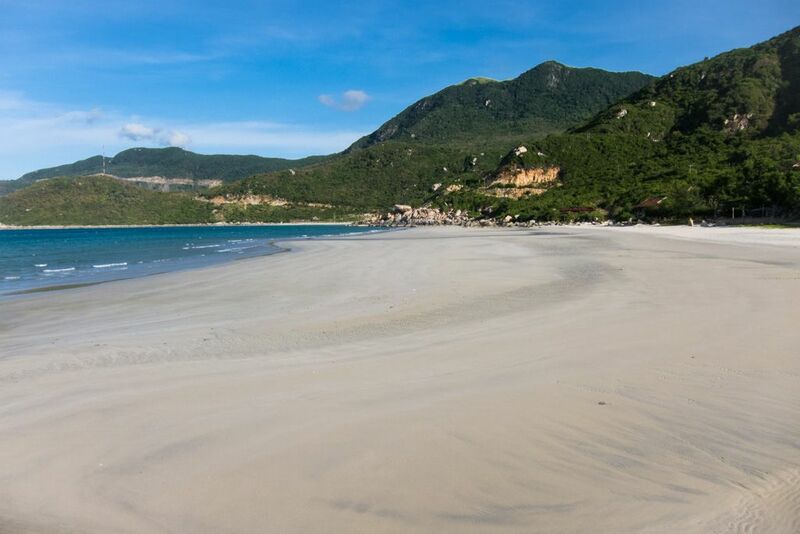 Low tide – Low tide at Jungle Beach was made for frolicking! 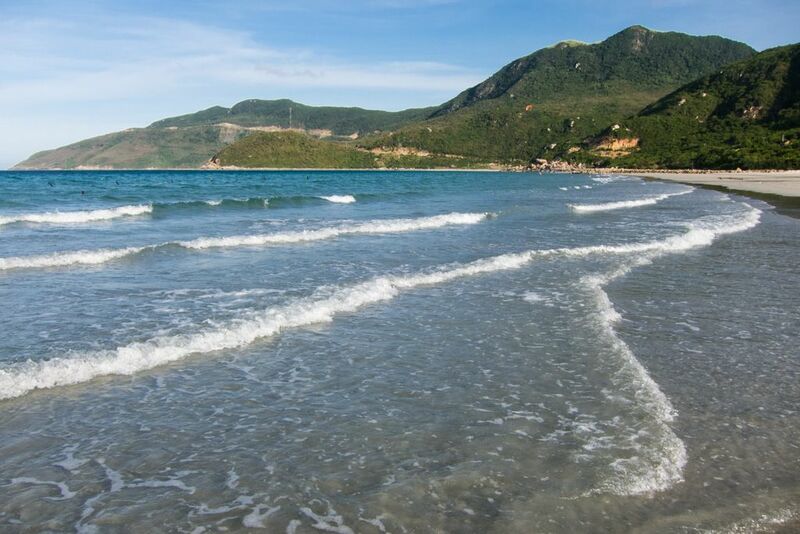 Every day I walked the entire length of the beach on smooth sands, which made for a great escape from the tour group. 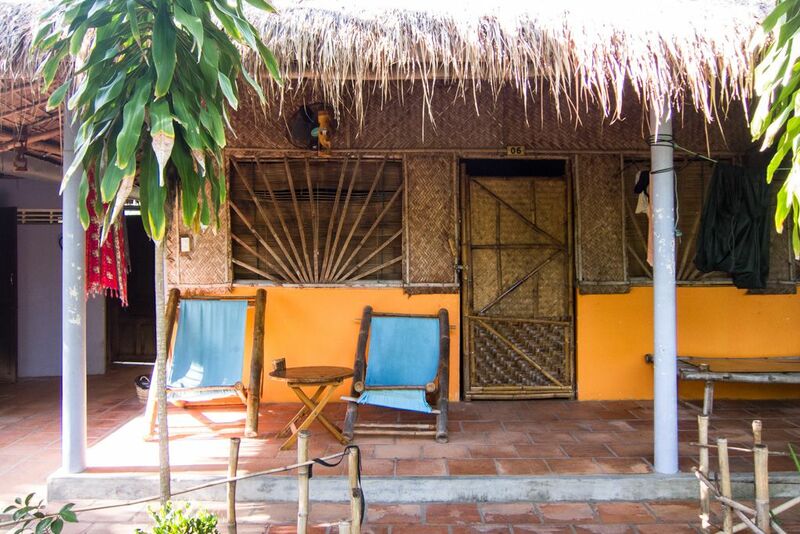 Accommodation: A bungalow at Jungle Beach is $30/night and includes all meals plus unlimited water. Coffee and alcohol are extra. Getting There: There are no direct buses to Jungle Beach. 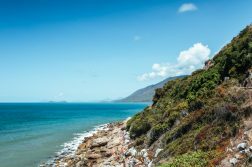 The closest you can get by public transport is taking a bus on the Nha Trang – Hoi An route and asking to be let off at the Doc Let petrol station. From there, you’ll have to take a moto to the beach (about 30 minutes further). 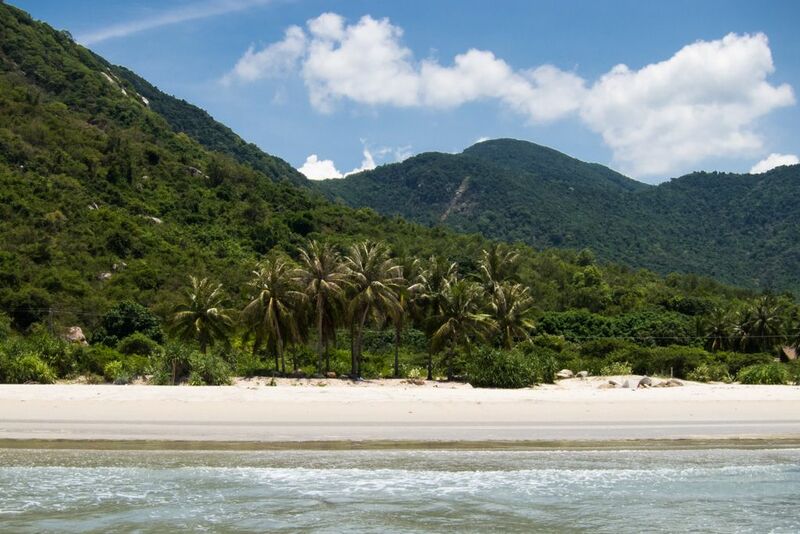 Alternatively, you could just take a taxi/moto direct from Nha Trang to Jungle Beach, though it’s a long and expensive ride! I paid 200,000 VND ($9.50 US), though this was WAY below the asking price. Leaving There: Jungle Beach staff can reserve a seat on the bus for you and arrange a pickup by a moto driver who will take you to the nearest petrol station and wait with you there until your bus comes. The motorbike trip to the main road is a fixed 125,000 VND ($6 US), and a seat on the sleeper bus from Doc Let to Hoi An was 250,000 VND ($12 US). Previous ArticleMui Ne: Is This Really Vietnam?